One particularly dedicated Team Fortress 2 fan has created his own class update for the game's lovable Texan hardhat, and it's crazy cool. Let's get one thing straight right off the bat: Valve is currently hard at work updating the Engineer class for TF2 (or rather, hard at work doing something that isn't developing Episode 3), but the official update isn't this one. That doesn't mean it isn't really cool, though. It's the work of talented Brazilian graphics artist (and obvious TF2 fan) Diogo Lima, the same person who brought us the fake Guard Dog Update back in September. It's pretty professional, actually - Lima's version of the Engineer Update would come with its own "tech tree" of a sort, giving the Engineer a choice of what to upgrade his buildings into. 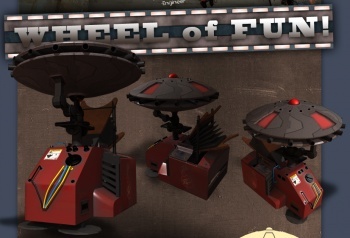 The Sentry, for instance, can become either the "Big Bertha" with higher health than normal and an added dual pipe bomb launcher (though slower fire and target tracking), or the "No-Turn," a circular turret with a 360-degree fire arc, but no rocket launcher and a high rate of ammo consumption. Some of the other goodies Lima has dreamed up are the Amplifier, a Dispenser that increases your teammates' crit ratio while not providing extra ammunition, and the Doomsday Device, a giant electromagnet that pulls enemies in before detonating. The artistic design melds perfectly with TF2's style, the models are really cool, and the only thing that gives this away as not being official is the fact that English isn't Lima's first language. Some of the descriptions aren't as natural as they might have been (and the Engie probably wouldn't say "'tis") - but that's not any fault of his, of course. Otherwise, I can totally see some of these in the game. Maybe Valve will take some ideas from the fan's work?